Get in contact with Eric Legault via email at ericl@apevibro.com. APE is again called to duty in Northern Manitoba. 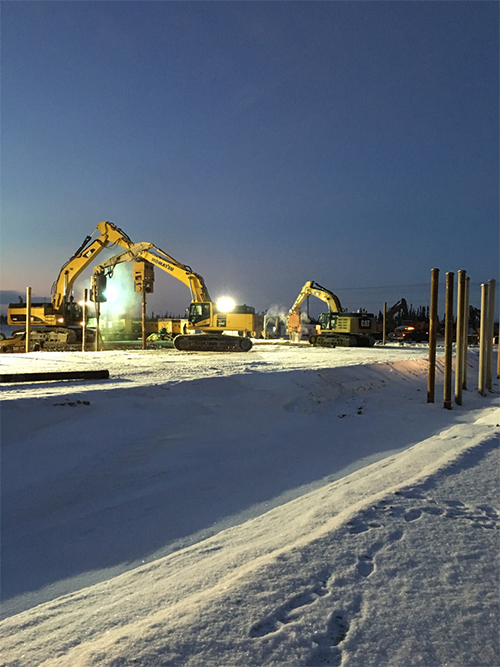 A couple of years ago, APE did a 5000 pile job for a 3,000 man camp at Keeyask, where we showcased some of our pre-drilling capabilities. Now it is the converter station at Keewatinohk, where we are pre-drilling the seasonal frost, discontinues permafrost, and some Canadian shield with our latest achievement in drilling technology, the “Polar Penetrator.” This patented drag bit allows high pressure air to eject cuttings out of the hole as soon as they are loose, typically at least twice if not three times faster than conventional tools. 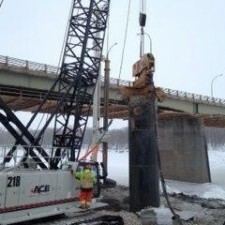 This drilling technique, along with the “down hole” accessories , allows APE’s HD program to stay in the lead on today’s helical pile market. 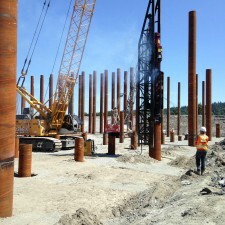 K+S Potash Canada (KSPC) is building a potash handling and storage facility at Port Moody, British Columbia. Potash products arriving by rail from the Saskatchewan-based mine will be stored on site and transported to vessels destined for K+S Group’s international clients. 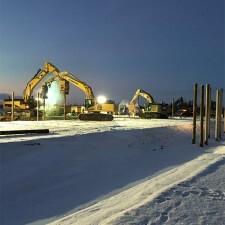 There was roughly 700 driven pipe pile ranging from 24” to 36” that needed to be driven. 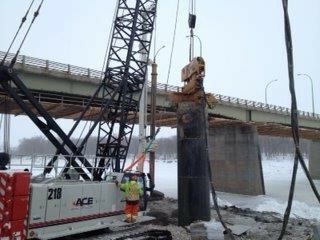 Keller Foundations opted to go with the APE D70-52 as their work horse for the majority of these pile. This 7.0 metric ton ram is pound for pound the hardest hitting hammer out there today, and its new octagon design allows for better cooling and larger fuel capacity, making hard driving jobs……just a little easier. Preset Construction was given the task of stabilizing the Red River bank just south of Winnipeg in the small community of Morris. 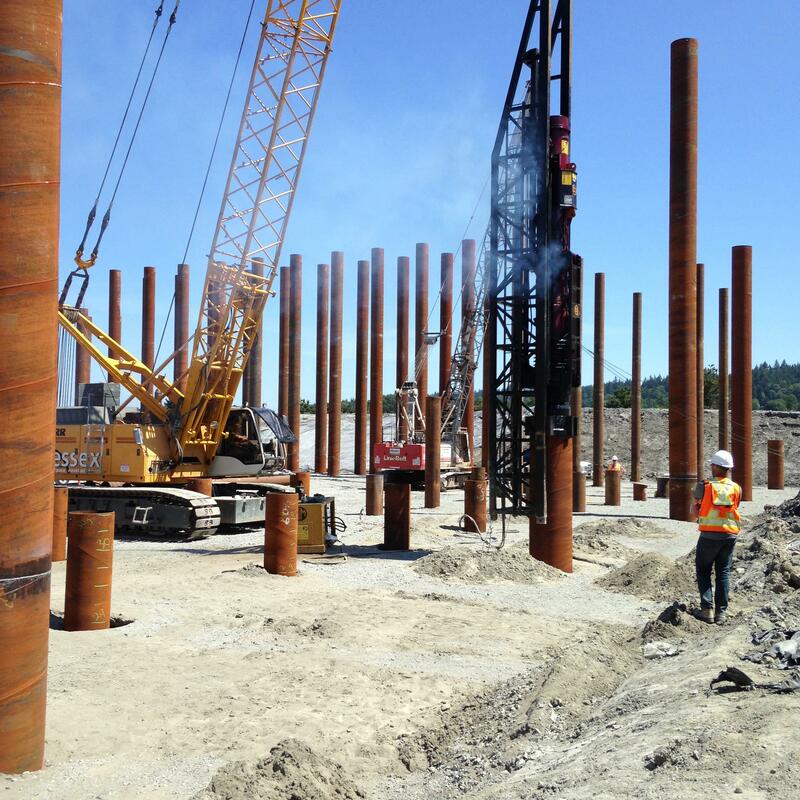 The piling ranged from 7’ to 10’ diameter and from 40’ to 60’ long. 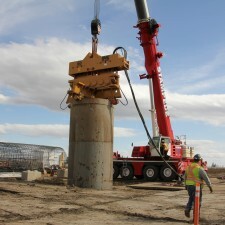 As we approached this project the concern was not driving the cans, as they were predrilled 100%. The concern was extraction, as the clay material just above the till lens was very cohesive. 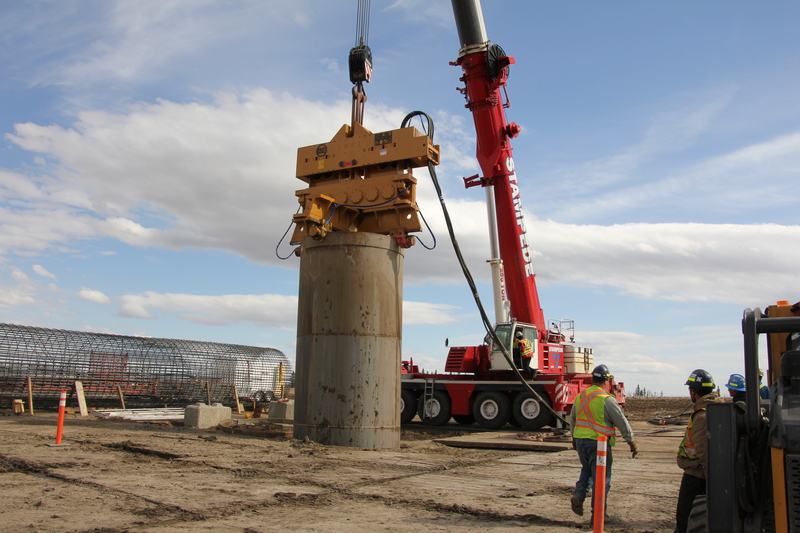 With the APE two stage suppressor capable of 180 tons of line pull, we were able to prove ourselves again even in the hard climate, as the industry leader in vibratory technology. © 2009 American Piledriving Equipment.